In 1990, Mario got to live the dream. He made friends with a dinosaur. Not just any dinosaur, mind you, but the one and only Yoshi! They fought Koopa Troopas together, saved princesses together, and they even did other cool activities together, like Mario Karting and tennis. That kind of sounds like the dream of any kid if you ask us! Well, now you can have a Yoshi of your own! You can head on your own adventures with him and he’ll even carry some of your stuff for you. 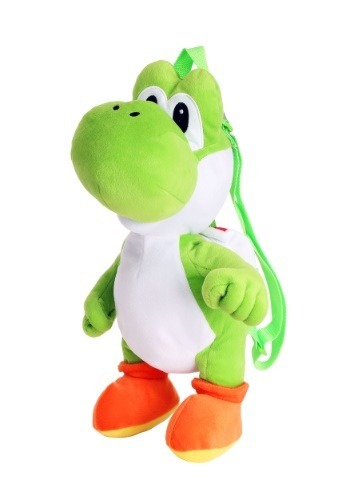 This Super Mario Yoshi plush backpack brings you the lovable dino from the Nintendo video games. He’s soft, bright green, and he’s quite huggable! There’s a zipper in his back, which reveals a compartment for your small necessities. He has adjustable shoulder straps, so just sling him on your back and you’ll be ready to head out to save Princess Peach… or you’ll be ready for a trip to the mall! This handy backpack also adds a great finishing touch to any Super Mario Bros costume! Just dress up as Mario and throw this Yoshi backpack on your back. Bowser won’t even stand a chance against you.